Thanks Mike for submitting. Couldn't agree more. A new USA Today/Gallup poll shows that when it comes to assigning blame for the country’s economic woes, more Americans point the finger at Washington, not Wall Street. 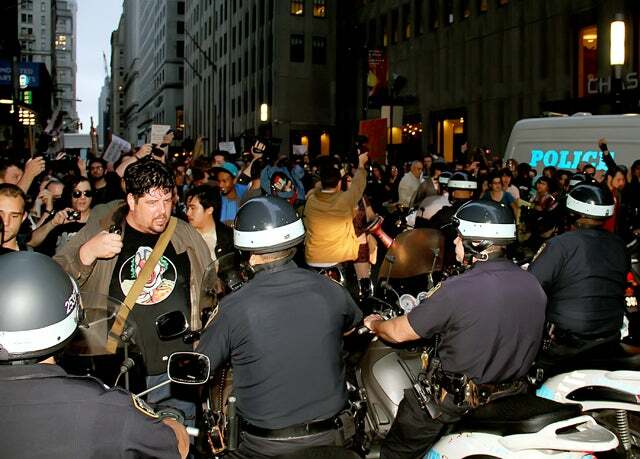 Yet for weeks, the so-called Occupy Wall Street protesters have camped out in the heart of America’s financial district–and have raised their voices in cities across the country and around the world–decrying the capitalist system as the root of all evil. On Sunday, these anti-capitalist protesters got a helping hand from none other than the President of the United States. Barack Obama was all too glad to lend support to the protests–which have at times been marked by shows of violence and lawlessness–saying during a speech dedicating the Dr. Martin Luther King Memorial that King would have supported the movement. And yesterday, a White House official said that during his latest “jobs” bus tour, the President would be speaking to the ”the interests of the 99 percent of Americans”–echoing the protesters’ “99 percent” slogan. It’s all very ironic. President Obama’s policies have helped create and prolong the economic conditions that are causing America’s frustrations. It’s not surprising that, at a time of 9.1 percent unemployment, there is great dissatisfaction with policies that hurt the economy while helping political cronies and bailing out banks and financial groups. For instance, calls for severe limits on trade are a prescription for a second Great Depression and would hurt the poor in America and around the world most of all. The same is true for penalizing financial transactions through additional taxation or regulation. Capital is the lifeblood of job creation–starting viable new businesses or expanding existing employment opportunities is impossible without a thriving financial sector. As the life of Steve Jobs shows, the free market has provided more wealth and spurred more innovation than any other system in history. Much as they try to vilify private enterprise, the protesters cannot deny this fact, especially as they use their iPhones to connect to AT&T or Verizon wireless networks in order to spread their messages on Facebook and Twitter. All of those innovations were bred and put into their hands because of the free market. Capitalism, by which is meant nothing more or less than respect for private ownership and the freedom to transact with other human beings, has provided more opportunity, increases in living standards, and overall well-being for the greatest number than any other system ever devised. It depends on freedom and in turn generates more freedom. The protesters are right to decry out-of-control bailouts and corporate subsidies. The Heritage Foundation, too, has long denounced out-of-control bailouts and subsidies. Expanding the size of government will not end such policies, however. Instead it will expand them, as Obama’s expansion of bailout programs and support for aid to favored, politically connected energy companies shows. Moreover, while the protesters are decrying Wall Street bailouts, many are advocating for more bailouts for themselves, such as student loan forgiveness and mortgage bailouts. This is just as contrary to the capitalist system as is bailing out failed industries. Ultimately, the protesters are expressing dissatisfaction with the direction America is heading. That dissatisfaction is shared by many Americans on the right, left, and center. America is headed in the wrong direction. But the answer is not to accelerate the present course of more government and less freedom. Instead we need to free ourselves from over intrusive government and trust the 99 percent to make their own decisions in a free marketplace. The protesters are right to be frustrated with the state of the economy, the continued unemployment, and the lack of job creation and opportunity. But there’s a better way to solve the problem–the government should do no more harm, get out of the way, and let private, free enterprise work.